Penelope Trudeau has always loved to make things, and she was encouraged in her artistic pursuits throughout her childhood in Missouri. Eventually she went off to Drury College thinking she would be an art teacher. However, other disciplines caught her eye, and she was off on a 27 year career in hospital-based business, most of it in Minnesota. She spent those years in human relations, labor-management relations, and hospital administration. Along the way she also went to law school, graduated with honors, and she remains a licensed attorney. Her Mother was instrumental in getting her started with sewing when Penelope went home from college to announce her engagement to be married. Her Mother met her with a portable Singer sewing machine saying, “If you intend to dress as a married woman the way I have dressed you, you need to learn to use this.” She did. 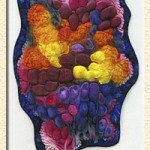 Penelope began her current fiber art efforts in 1993, retired (early) from the hospital world in 1995, and immediately turned to her art as a full time career. Since then she has been juried into international events and been a finalist in national and regional competitions, won awards for her work, and has shown and sold her work in many fine arts shows. Her work has been included in several books. Penny’s work is by hand. Almost all of her work qualifies as quilting, although it is much different from what most people know as traditional American patchwork or applique. 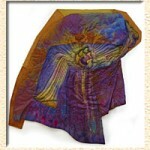 She uses hand dyed original fabrics, some dyed by her and many dyed by other fiber artists. 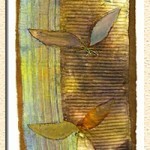 She uses a wide variety of hand techniques, creating contemporary art using old, traditional methods. 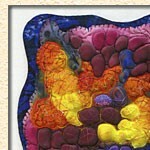 She does her quilted pieces on speculation and on commission and has a special interest in liturgical fiber art. She also creates hand knit garments of original design. Contact her for other product lines. Her husband, Dennis, is an essential part of her quilting business, giving her artistic opinions, sales and marketing advice, and personal support.